Akito Tsuda’s images originate from an instinctive drive where imprecisions, such as shadows or out-of-focus shots, are an important part of the narration. I am thinking of photographic projects like Tom or Maxwell Street, set in the Mexican district of Chicago, Pilsen. Akito participates in the life of the streets to document it in each of its daily actions and gestures. 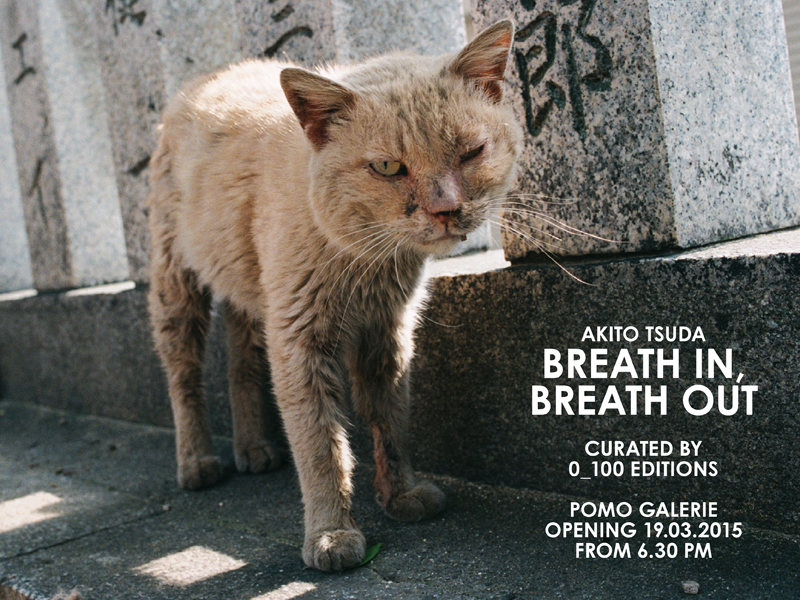 In Breath in, breath out he photographs stray cats in Osaka and Tokyo. He builds an intimacy with them, allowing a mutual fascination to develop while taking close-up portraits of them. The cats have mangy fur, deep scratches on their muzzles, some of them are missing their tail or an eye. They still bear the vivid signs of the previous night’s battle. In 2014 Breath in, breath out was published by 0_100 Editions, a small publishing house which proposes different projects and formats in limited editions of one hundred copies. Like the previous publications of the same house, Akito Tsuda’s stands out for its beauty and narrative power, though it does not include texts or captions. “I had never thought of taking a photo of cat since I could not find a value of bothering a life of such a small sensitive creature. but, I was gradually drawn toward meeting with cats after I failed to a disease and had to stop taking a photo of dogs on the street. I used to take photos of a dog living in my neighborhood. street dogs are sometime intimidating and unpredictable with their moves. I was often nervous forecasting the worst situation in my head, my heart was beating fast loudly and I needed to take a deep breath before getting close to them. but at same time, I realized that facing a dog on the street would be a good way to get to know myself better and discover my weaknesses, such as cowardice, slyness, and selfishness. It was a great experience for me to become aware of my immaturity. those experiences gave me a stronger motivation to approach a dog on the street and kept me going. It was not easy to overcome my weakness. I continued to act differently depending on the size or the numbers of street dogs; however, facing them gave me mental strength. After taking photos of dogs for a while, getting close to them became a risk of relapse for my disease and I had to avoid facing them. I could not think what I would like to do with my photograph after that since I was still a far from accomplishment. I just kept on walking within not far from my home, in my neighborhood and surrounding area, believing that keep on walking would pave the way to new discovery. One day, a cat sitting on the side of road stopped me. I had avoided taking a photo of cats ‘cause they are photogenic and often easily visualized as a comfort or healing subject. I usually wanted to leave them alone, but not on that day, I couldn’t resist approaching to that one in particular; I was probably hungry for that photography. I did not expect getting much closer and thought she would run away before noticing my presence, but she did not make a move and completely ignored me - I was lying on my stomach on the ground. Witnessing that cat’s strong piercing eyes blew away my prejudice against them all. I clicked the shutter of my camera a few times. the sound of shutter did not bother her at all. she was unflinching and remained calm. my first encounter with a street cat was so impressive - it overturned my previous thoughts and I could not stop myself from looking for more cats on the street from then on. I have bothered many cats ever since. If my interest was to observe their behavior, using longer focal lenses would solve my concern of disturbances. but my interest was to get close to the subject like I have done with street dogs, so I wanted to approach as close as possible, trying to feel each other’s breath. AKITO TSUDA is a Japanese photographer born in 1966. His work has been presented in private and public institutions, galleries, and festivals. Breath in, Breath out is a project from 2001. 0_100 EDITIONS is an independent publishing project dedicated to contemporary photography and to printing photographic reports in limited editions of one hundred numbered copies. on a specific subject which gathers well-known authors and professionals as well as students and amateurs, creating an ideal collective visual laboratory. In 2012, some publications of 0_100 Editions were exhibited in the Millennium Magazines exposition at the New York Museum of Modern Art. The entire 0_100 Editions bibliography was acquired by the MoMA Library.